Iraq's successful Olympic football team has launched an outspoken attack on US President George W Bush. Midfielder Salih Sadir said the team - which won its group stage in Greece - was angry it had been used in Mr Bush's re-election campaign ads. One accused the US leader of committing "many crimes", and another said he would be fighting US troops if not for Athens. Their comments were made in a US Sports Illustrated magazine interview. Salih Sadir said he was angry at Mr Bush's campaign adverts showing pictures of the Afghan and Iraqi flags with the words: "At this Olympics there will be two more free nations - and two fewer terrorist regimes". What is freedom when I go to the stadium and there are shootings on the road? "Iraq as a team does not want Mr Bush to use us for the presidential campaign," said the Iraqi player. "He can find another way to advertise himself." He called for US troops to be withdrawn from Iraq. "We don't wish for the presence of the Americans in our country. We want them to go away." Another star player, 22-year-old Ahmed Manajid, asked: "How will [Mr Bush] meet his god having slaughtered so many men and women? He has committed so many crimes." Mr Manajid, from Falluja - a hotbed of armed opposition to the US-led occupation in Iraq - said if he was not playing football "for sure" he would be fighting as part of the resistance. "I want to defend my home. If a stranger invades America and the people resist, does that mean they are terrorists?" he asked. "Everyone [in Falluja] has been labelled a terrorist. These are all lies. Falluja people are some of the best people in Iraq." The team said they were glad Iraq's former Olympic committee head Uday Hussein - Saddam Hussein's notorious son killed by US forces after the invasion - was no longer in charge. 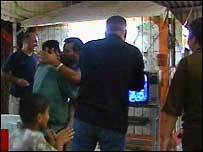 But coach Adnan Hamad said he was concerned with what the Bush administration was doing in Iraq. "My problems are not with the American people. They are with what America has done in Iraq: destroy everything," he said. "The American army has killed so many people in Iraq. What is freedom when I go to the stadium and there are shootings on the road?" Mr Bush's spokesman defended the war on Iraq and the campaign adverts. "The ad simply talks about President Bush's optimism and how democracy has triumphed over terror," he was quoted by the Press Association as saying. "Twenty-five million people in Iraq are free as a result of the actions of the coalition." "This is a country that loves football"